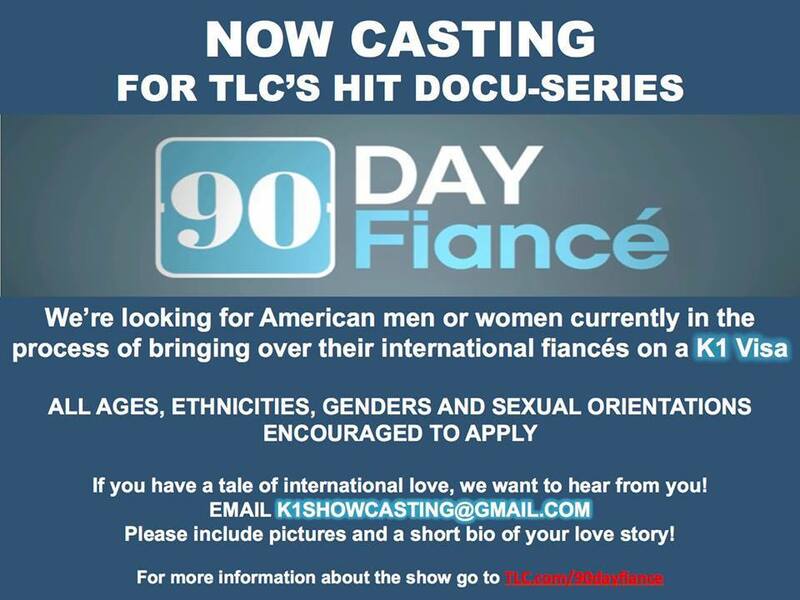 90 Day Fiance is holding a casting call. The TLC show is coming back for a 2019 season and now casting couples with some location issues. Please note that the show is only casting for those in the US who have a fiance that is in another country and working on getting to the United States for the wedding. The show will be holding online auditions / castings for those who fit the description. Looking for couples who are in the K-1 visa process and want to share their love story. Cameras will follow couples from their arrival in the U.S. through their wedding day. All ages, ethnicities, genders, and sexual orientations are encouraged to apply. The international partner should be planning to arrive in the U.S. before summer 2019. Email: K1ShowCasting@gmail.com with your personal story, current K-1 status and expected U.S. arrival date, and a few recent photos of you and your fiancé.